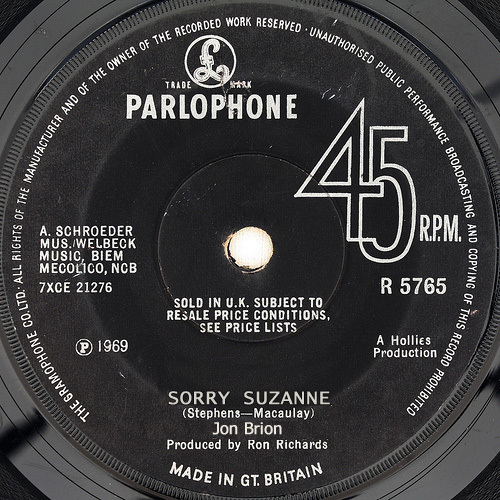 Secret Single: Jon Brion, "Sorry Suzanne"
Popdose.com takes another flight into alternate musical realities; this one is where Jon Brion becomes a huge star. It’s no big secret that we here in the spacious Popdose Offices drift off in our revisionist flights of fantasy from time to time. It’s bound to happen. We’ve come to the end of Football season and our fantasy teams have all hit the skids. We’re a few months from Baseball season and our fantasy teams all look ghastly. There’s nothing much else to do but sip our espressos down in the commissary while dunking our boysenberry scones, making up alternate musical realities as we go. In this nether realm of lost Springsteen albums, continued Beatles offerings and Popdose Offices, sits a 45 on my nether-desk. Upon the release of the Paul Thomas Anderson movie Punch-Drunk Love, the world was immediately enthralled by the song in the credits by one Jon Brion. As a bit of a goof, Nonesuch Records in conjunction with Parlophone in the UK released the track as an old-school vinyl single. Little did they know the stir it would make. went to platinum and the whole of the music culture was never the same.
. Brion became a go-to producer, adding his touch to albums by such diverse artists as Kanye West and Of Montreal. He also became a fixture at the L.A. club Largo, but he has not produced an album of his own in many, many years. So let’s just enjoy what might have been, order up another cappuccino from barrista Gabrielle or Gabriel, spread some marmalade on our pastry and let the fake 45s spin.